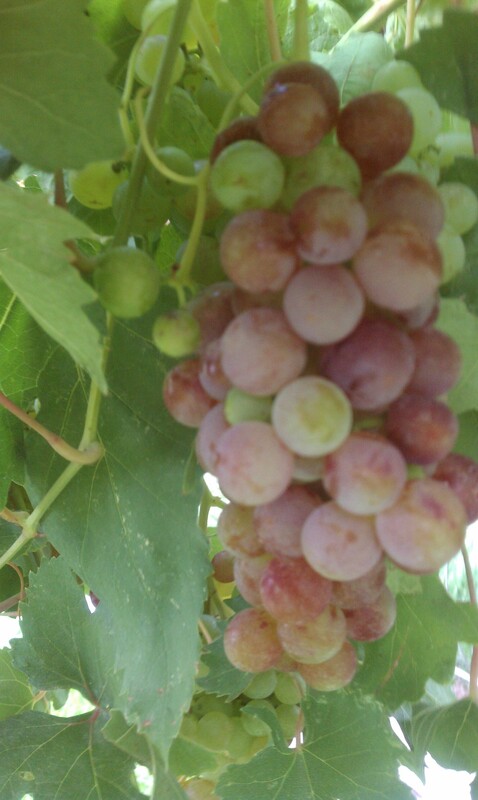 Red Flame Grapes just about ready! 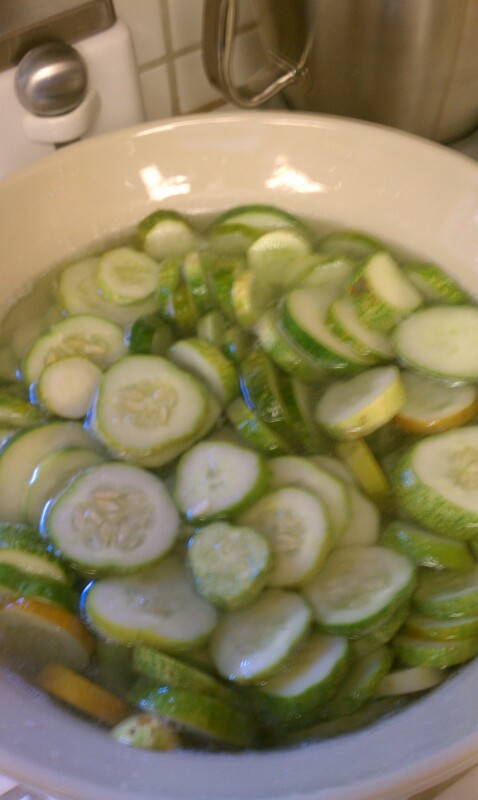 Picking a bushel every other day! 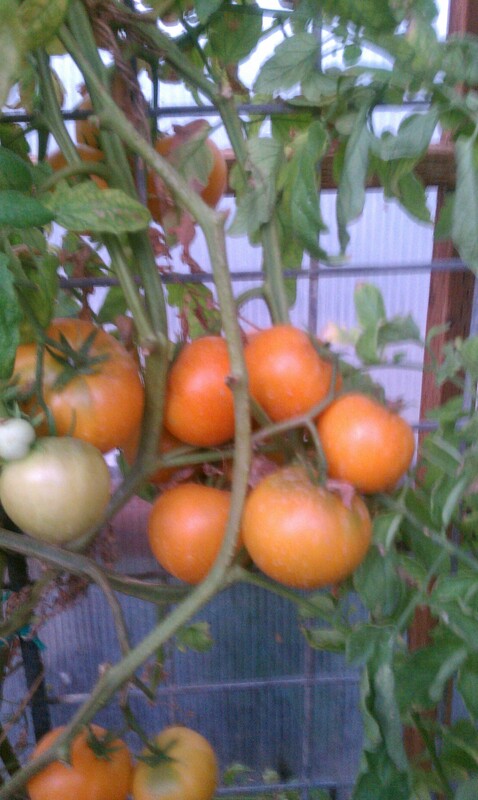 Golden King of Siberia, my favorite tomato this year! What a busy month! We jumped into July with sailing temperatures at 112 degrees. Pretty typical for July in Southern Utah, just always hard to get used to! Our garden stressed, wilted, but somehow it again survived. The heirloom tomatoes have produced like no other year! I would like to think my new planting mix did the trick. But I can’t dismiss the fact that I was very diligent about spraying kelp tea and liquid bone meal, covering with row cover and treating them like a baby. 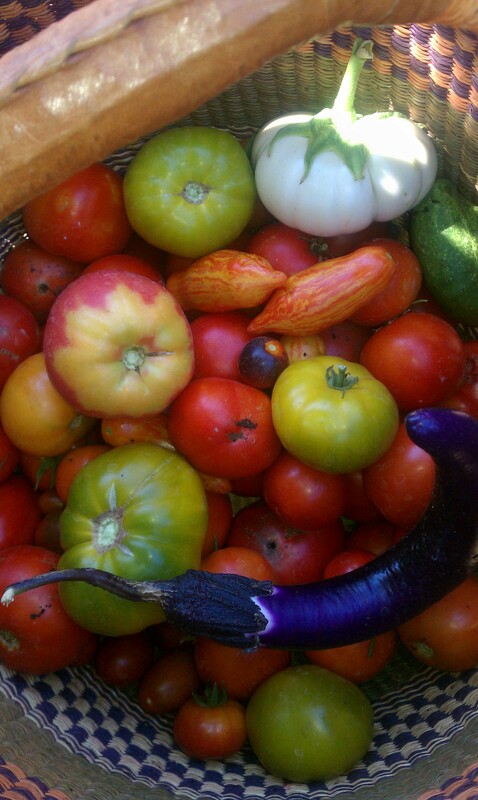 We have had beautiful heirlooms of every color shape and size. I have my favorites again this year. Golden King of Siberia, a HUGE yellow heirloom. 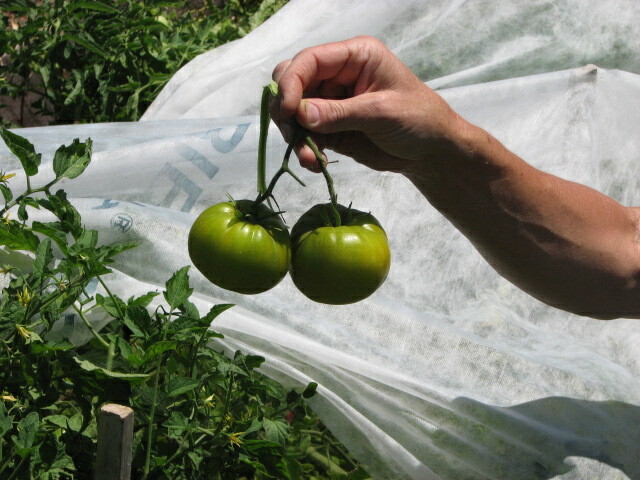 Although it has only produced a slight bit more than a dozen tomatoes, they have all been over 1-1/2 pound fruit. This one is not acidic, but it is very sweet. 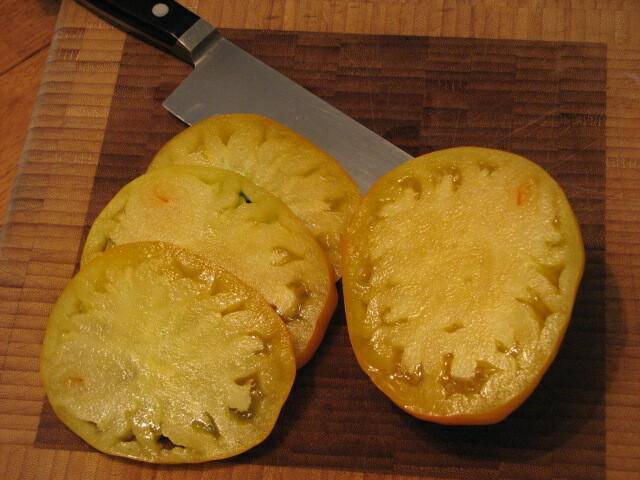 Bread & Salt is another huge tomato that produced heavy with several weighing in at just over 2 pounds. One of my most productive tomatoes so far this year was the Orange Fleshed Purple Smudge. The purple smudge, is just that, a fun little smudge on the shoulders. Off of one plant we probably picked over 4 dozen tomatoes, and it’s still going strong. Beautiful, although it’s not my favorite, others who tried, enjoyed the flavor. There is a tomato for everyone! Everyone’s favorite this year is the Kiwi. Resembling its color, not so much the flavor. Mild, but still that great old-fashioned tomato flavor with a twist! You might think it is not ripe, but once convinced green is ripe with this guy, you will be hooked! Just when we thought we couldn’t take the heat any more we were hit with moisture and lots of it! We did get hail the size of a nickel, but luckily this year there was not much damage. Before the July rains, our rainfall for 2012 was only 3″! We have received over 3.5″ of rain within the last few weeks. Oh, the vegetable garden has greened up, grown like crazy with the lightning storms which has helped the plants grab the nitrogen! 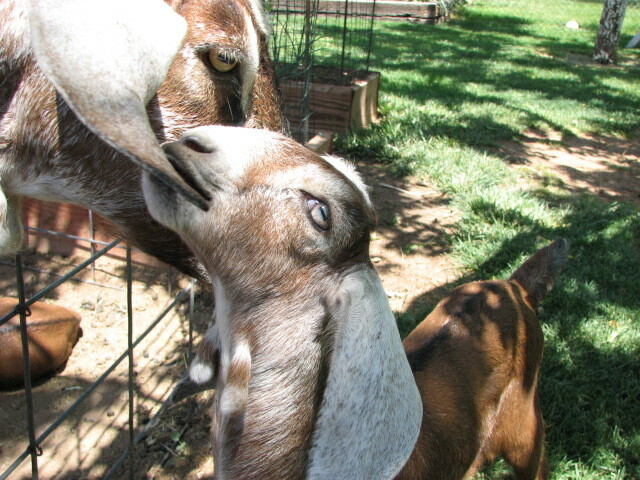 Our dairy goat, Ivy is producing over 3/4 a gallon per milking. This is her first year, so she is doing super. She does get the best hay, organic grain and plenty of healthy bites from the garden. Both her twins are growing like weeds. If you have never had a baby goat, you are missing out in the amusing show of jumping around the barn yard full of energy (energy I wish I could bottle). We have made kefir, feta, summer cheese and buttermilk. This is when the chores pay off! We had chaos in the milking barn when our mother rabbit escaped, and when I opened the door to the barn she bolted in and disappeared behind the hay storage. Yup! 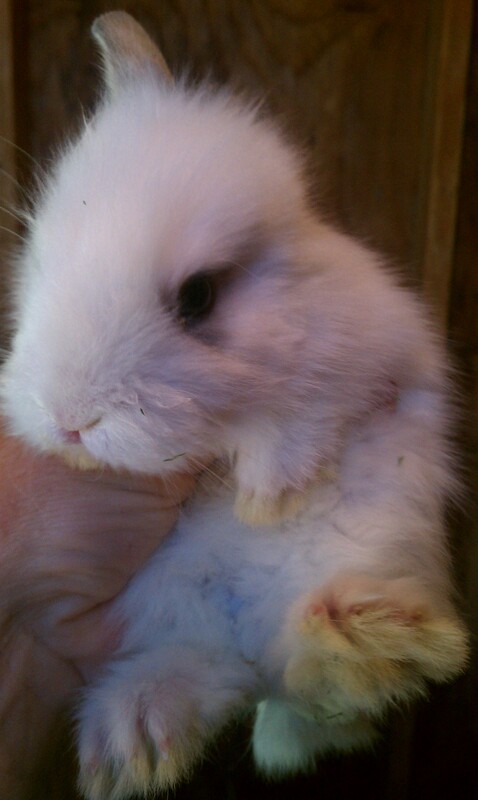 She’s a rabbit! 5 new babies. We had little fast hoppers running in an out of the hay until my daughter sat patiently with me till we had them all caught. Even though we have homes for all of them, well…..She’s mama is a AGAIN! You know that old saying…They breed like rabbits. It’s true, she certainly has it figured out!!! Casper (the perfect cat) wasn’t feeling well, so off to the vet we went. The poor little guy had to have all but a few teeth removed. The few that are left are for decoration purpose only. It’s only been three weeks he is back to normal. Sleeping on the cash register, roof of the barn, and tomato patch and screaming for food. Not up to being a farm cat, but then again, he never was! Maybe this will slow him down on chewing my nursery stock of herbs! Doubt that! Bottling tomatoes, drying fruit, preserving currants and roasting peppers have been big on the list of chores with peaches, pears, figs and apples on their way to ripen. The constant fallen fruit pick up is a must so we don’t get brown rot in our fruit in years to follow. Good hygiene in the garden is added work right now, but well worth it in the long run. 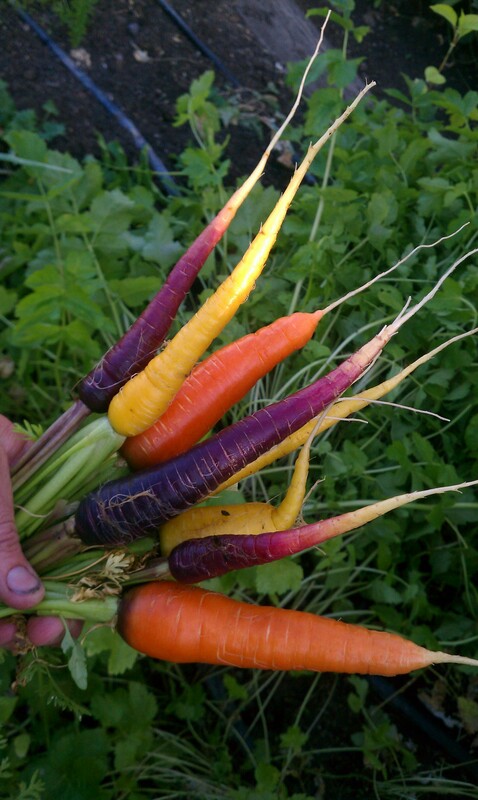 We have fewer disease, pest and problems when old fruit and veggies are removed and tossed into the compost pile. 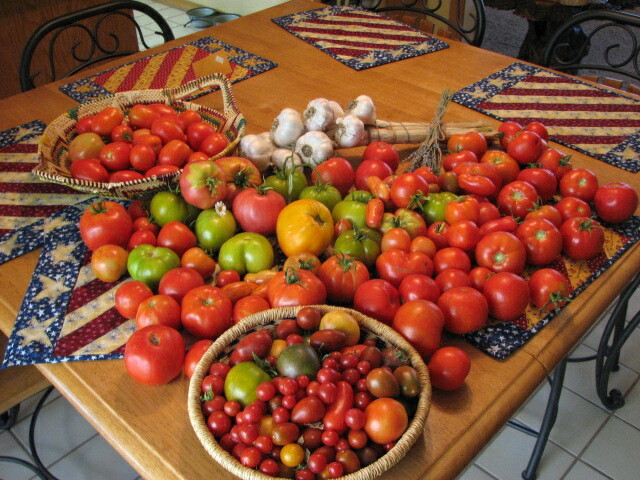 Tomatoes, or anything else for that matter that has dead leaves, should be removed in case of blight or other disease. This stops or at least slows the problem. Don’t use diseased plant matter as a mulch! Remove it from the garden. Believe it or not the greenhouse is back in swing! Several flats of brassica are started and getting sized up for fall planting. Keeping the little seedlings wet is so important! Brassica family, especially cauliflower does not produce well later on if they are allowed to dry out at any time of their life! This is the time of year where the heat ‘peters’ us out, but if we can preserver, fall is just around the corner and this is sometimes the best of all the harvests. 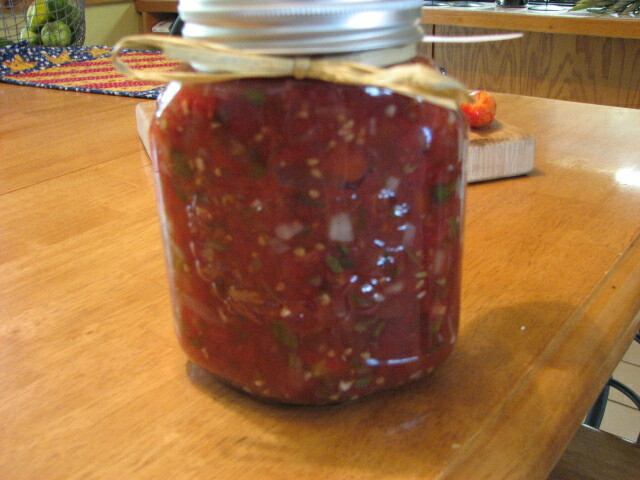 Tomatoes aren’t as watery, peppers don’t get sunscald and flavor seems to improve. Keep weeds in check to save yourself time later. Even if all you can do is cut off the seed heads. Deadhead your perennials for lasting blooms. 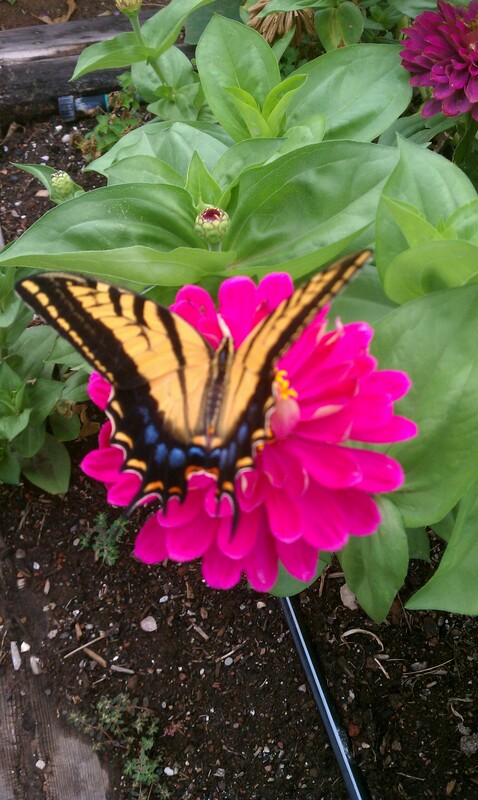 Start to fertilize again when new blooms develop. Remove diseased plants so as not to spread. Side dress with compost. 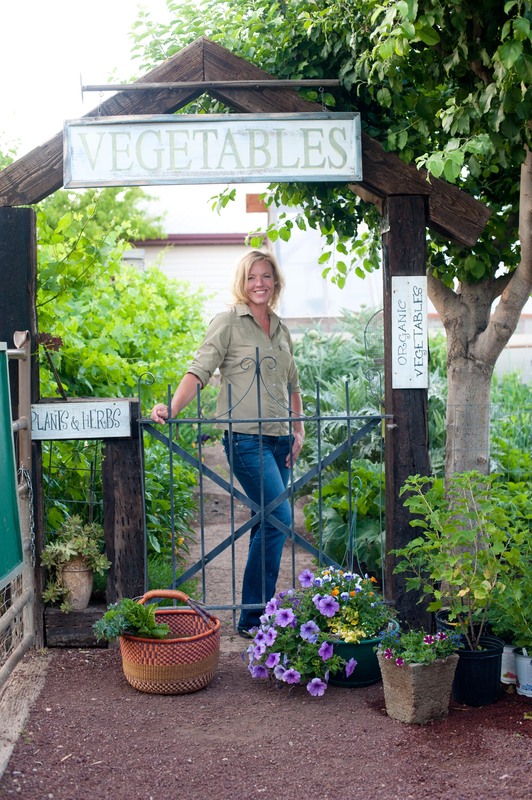 Compost will help keep the soil moist, cool and add tilth. If you have plants that are struggling, give them a hair cut to revive them and boost them with some kelp tea. Enjoy the rest of the summer. Sit down in the evening with a glass of lemonade in your garden and watch the sunset.